Originally introduced with the avid astrophotographer in mind, the 155mm f7 StarFire EDF (6.1 inch aperture) astrograph features the gigantic focuser and included the Field Flattener lens option accommodating up to Pentax 6x7cm camera format with full field illumination. It made an astounding versatile visual telescope too; capable of extraordinarily wide fields of view at lower magnifications, with the capacity to reveal subtle features on the planets at high magnifications that few other 25 lb. telescopes can show. The astronomy community came to appreciate the versatility of this instrument and at the urging of our customers, we now offer the same excellent 155mm f7 lens in a lighter weight tube assembly incorporating the highly regarded Astro-Physics 2.7 inch focuser. We continue to be amazed at the compact size of this instrument. 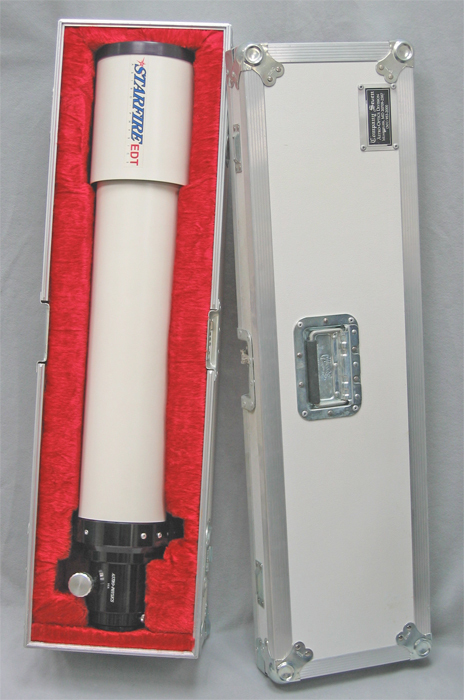 At last, a 6.1 inch Apo refractor with an overall length of 40 inches (with dewcap retracted). This is less than half the length of an fl5 and approximately a foot shorter than an f9! In fact, it is about the same length as our 130mm f8, but with an inch more of aperture! You can transport it in a smaller car, store it in less space, invest in a smaller mount and shorter pier/tripod. This instrument is the fulfillment of the astronomer's dream for a truly portable 6.1 inch refractor. The EDF is superb as a visual instrument. It is easily capable of high-power observations of the moon and planets. 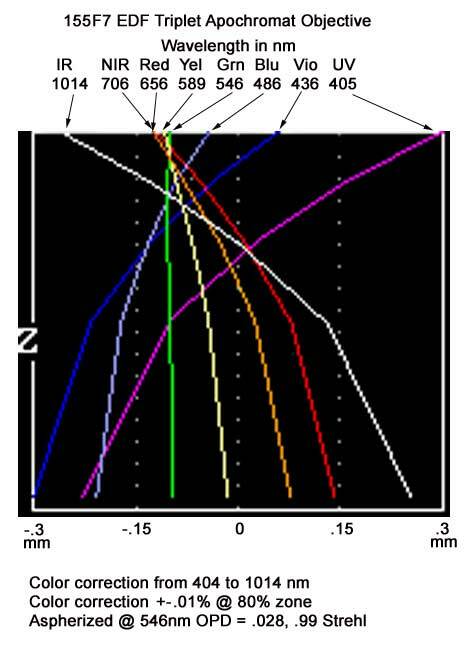 Secondary spectrum is totally absent at any power which allows you to discriminate the subtle color variations on the surface of the planets. Deep-sky views are equally impressive due to the very high transmission of the three glass types. Performance will rival larger obstructed systems because the contrast is excellent. Stars snap to focus. Individual stars of globular clusters are sharply etched as intense diamonds against black velvet background. A beautiful sight! This refractor can, of course, be used photographically with a 35mm camera at prime focus with only a simple camera adapter or at a fast f5.2 with the optional flat- field telecompressor. A single element field flattener is available for the Pentax 6 x 7 medium format camera, however the field is vignetted in the corners due to the restrictions of the 2.7" focuser (full coverage requires the 4" focuser/4" field flattener combination). The 2.7" focuser is interchangeable with the 4" model should you choose at some time in the future to upgrade to the full EDF 4" package. In the test report entitled "Astro-Physics Refractors Big & Small", in the September 1993 issue of Astronomy, Alan Dyer described the performance of the 155mm f7 EDF during his winter observing sessions. Please note that the article in error referred to this instrument as our EDT. "Optical performance of the 155EDT was impressive. It produced nary a trace of false color even on Venus. Equally impressive, this scope provided superb images as soon as it was set outside. Even in sub-freezing temperatures, image quality, though not perfect at first, was surprisingly sharp from the start. In cold weather, after a modest settle-down time of 30 minutes, in-focus star images were textbook Airy disks with a well-defined first diffraction ring and a trace of a second outer ring. There was no sign of spherical aberration, lens figure changes, heat plumes, or distorted Airy disks due to tube turbulence." For 2004 Astro-Physics has developed a new specially designed dual-speed pinion fine dual speed geared focuser assembly. Incorporating a 9 to 1 geared reduction knob, this is the Feather Touch® Micro Focuser option. 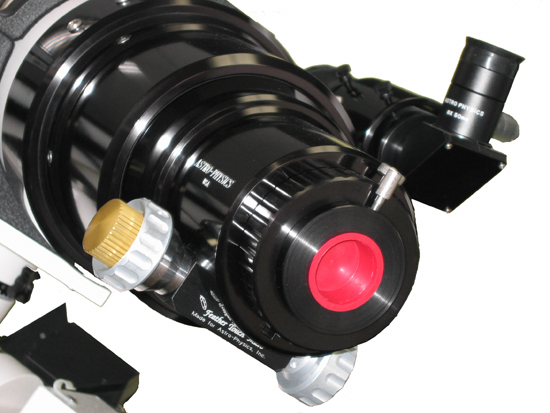 It is available as an retrofit kit for existing compatible Astro-Physics focusers. Or you can order it factory installed in your new Traveler telescope. Right: Feather Touch® Focuser option on Astro-Physics 155 mm EDF Apo telescope, optional Astro-Physics 8x 50mm Finder also shown (54,384 bytes). Left: Color correction of the Astro-Physics 155 mm EDF Apo telescope (69,285 bytes). Click on image for higher quality, enlarged view (178,123 bytes).